No matter if you would like to implement some minor changes or you are performing a large scale content push on your Online Store, you might want to consider disabling the availability of the store so no orders can be submitted during the changes you are implementing. This is usually done in order for major issues and customer dissatisfaction to be avoided in the process of upgrade implementations, design changes and basically every drastic change you make on your store. 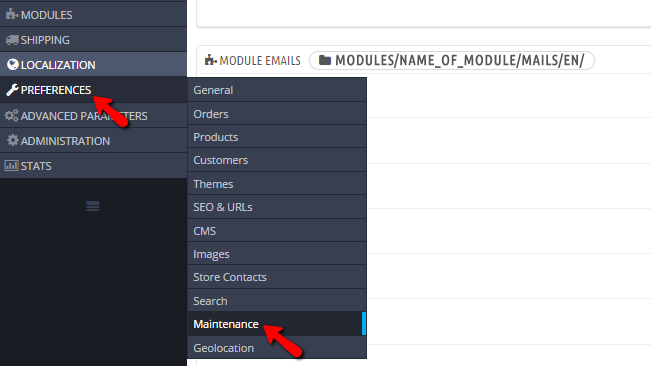 In the next few lines of this tutorial we will show you how to activate the Maintenance mode of the PrestaShop 1.6 platform. The activation process is relatively simple as PrestaShop 1.6 fully integrates this method as a simple routine in the Back Office of your application. In order to access the dedicated page for the maintenance mode you will need to login into your Back Office and then to navigate to Preferences>Maintenance. Once there you will be presented with a single section of settings containing two fields you have the option to edit. The first one is called Enable Shop and as the name suggests there you can enable or disable your Online Store. The second field is called “Maintenance IP” and it is usually used for only specific IP addresses to be allowed access to your Online Store during the maintenance window. If you would like to enter your IP address only you are provided with the Add my IP button which will automatically detect and insert your IP address in that field. Once you are ready with the configuration of these two options please use the Save button located at the bottom of the page so the changes can be saved. Congratulations! You can now activate or deactivate the maintenance mode of your PrestaShop 1.6 based Online Store!